One 4-pin JST-SH 1.0mm connector (referred to as micro-serial connector) for optional TTL-level serial (UART) connection to a microcontroller, such as an Arduino. Regulated 5V +/- 10% voltage. No less than 800mA current (so, a total of 4 Watts of power). Less current is possible if you know that you will only be using some machine vision algorithm that does not fully load the CPU inside JeVois, and which will hence yield a lower power requirement. No significant current and power flows through the micro-serial port (see Serial port user guide for additional details). Hence, you cannot power JeVois through the micro-serial port and you always need to power it through the Mini-USB port. Many power and data scenarios are possible. A few examples are given below. In the standard connection, JeVois is connected to one USB 3.0 or two USB 2.0 ports of a host computer. The host computer provides power to JeVois through its port(s), and also can communicate with JeVois through these ports (e.g., to stream video from JeVois to the host computer). The USB-A connector (big USB connector) that is connected to two wires (black large connector in the picture above, and P1 in the diagram below) will carry both power and data to JeVois. The USB-A connector (big USB connector) that is connected to one wire (red large connector in the picture above, and P3 in the diagram below) will carry only power to JeVois. The mini-USB 2.0 5-pin connector (small black above, P2 below) connects to JeVois and provides power and data to it. When using a Y-type cable with a computer that only supports USB 2.0, the long end of the cable carries power + data and should be connected to your computer (connector P1 in the diagram above), while the short end carries only extra power and can be connected to another USB port on the same computer, to a USB charger, to an externally-powered USB hub, or to a USB battery bank (connector P3 in the diagram above). The mini-USB connector (P2 in the diagram image) always connects to your JeVois smart camera. With USB 3.0, current output specification has been increased: A single USB 3.0 port is now rated to provide no less than 900mA of current (which, with 5V voltage, means 4.5 Watts of power). 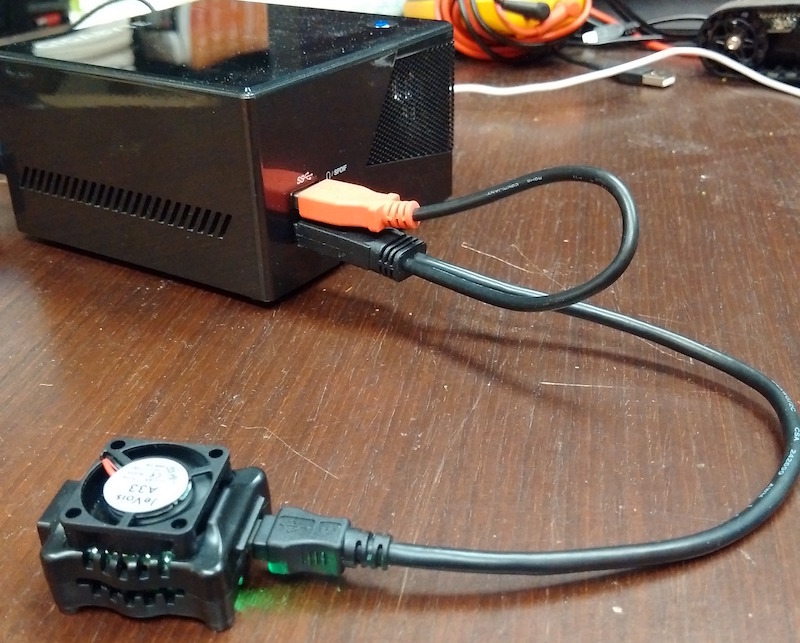 Thus, a host computer with USB 3.0 ports can power JeVois using one USB 3.0 port only. When using only one USB 3.0 port on a computer, you only need to connect the long end of the cable (which carries power + data) to your computer (connector P1 in the diagram above). Many mini-USB 2.0 cable types exist. The cheapest ones usually use the thinnest possible wires which can carry the data. These cables may not be appropriate to carry enough power to JeVois, as the very thin wires will not be able to carry enough current to JeVois. In the USA, copper wire diameter is measured using the American Wire Gauge or AWG for short. Smaller AWG values mean thicker wires that can carry more current with less loss. The cheapest USB cables may use 30AWG or 32AWG wire size (extremely thin). While this is appropriate for the data lines, it is insufficient to power JeVois. The above picture shows a cable that has 1 twisted pair (1P) at 28AWG for data, and 2 conductors (2C) at 24AWG for power. We have been able to fail to properly power JeVois by using cheap USB cables of unknown AWG rating, even at lengths of 20cm (8 inches). So just because a cable is short does not mean that it will work. If in doubt, check out https://jevoisinc.com as all the cables there are custom-manufactured and tested to work with JeVois under full load. In fact, we have now moved our manufacturing line to all 22AWG power wires to incur the lowest possible loss in the power wires (22AWG is even thicker than 24AWG and hence is better to carry current with low loss; but 24AWG remains suitable). Although USB 2.0 ports should be able provide 500mA of current according to the USB specifications, sometimes they are not. 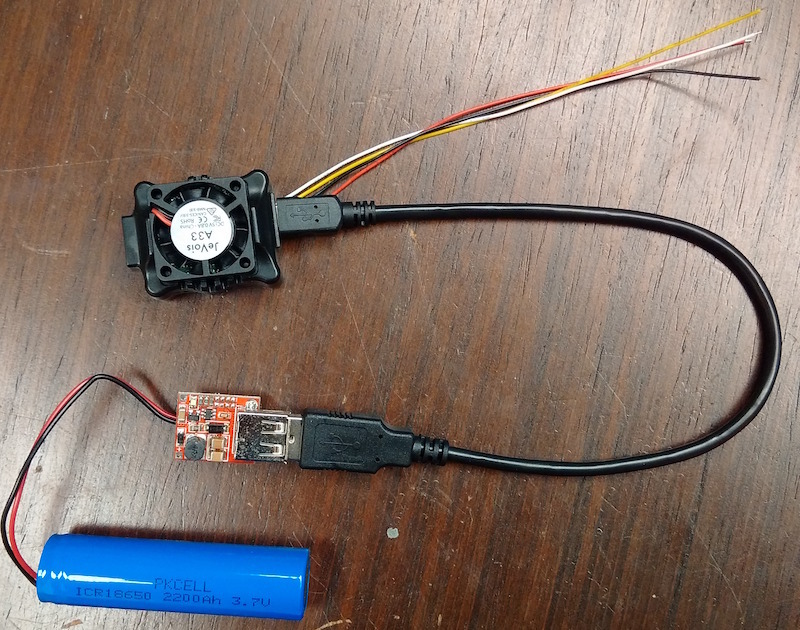 This is often the case in small embedded boards, which themselves are powered from a micro-USB connector, then relaying some of that power to their own USB ports. Power will flow from connector P3 via connector P1 to connector P2. Data (streaming video from JeVois to the embedded computer) will flow between JeVois (connector P2) and the embedded computer (connector P1). 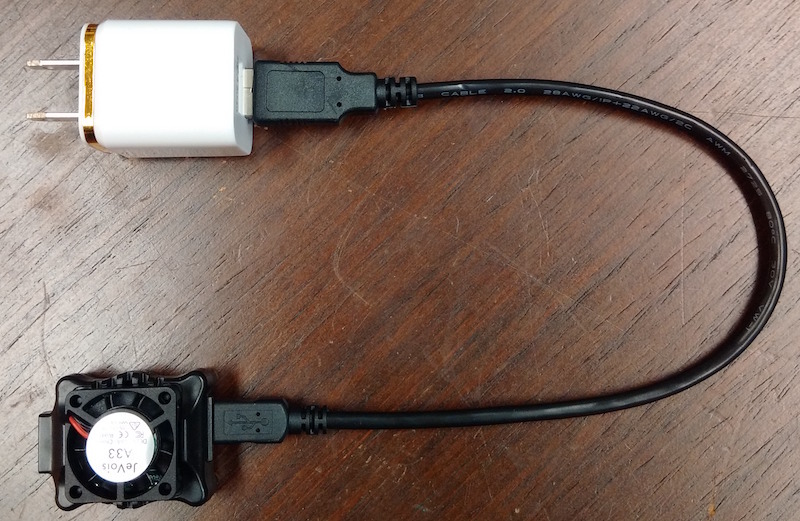 The micro-USB cable connected to the embedded computer at the right of the pictures is to power that computer, and it should be connected to a USB charger, USB power bank, etc. In such case, you would probably want to use a USB power bank that provides several USB outputs, as is usually the case with larger USB power banks; or, similarly, a USB charger with several outputs (the small white wall charger shown on this page has 2 ports; many USB charger models are available with 6 ports or more). JeVois does not always stream video over its USB port. In some scenarios, it can just work as a standalone computer. For example, the Surprise-based Video Recorder machine vision module uses JeVois as a smart surveillance camera, which will just monitor the environment and save a short video clip to its microSD card each time something surprising is detected. In such scenario, we only need to provide power to JeVois. This can be achieved using a USB charger, a USB battery bank, etc as exemplified below. In yet other scenarios, JeVois may not stream video over USB but may issue messages over its micro-Serial port, for example to provide information to a micro-controller on an autonomous robot. 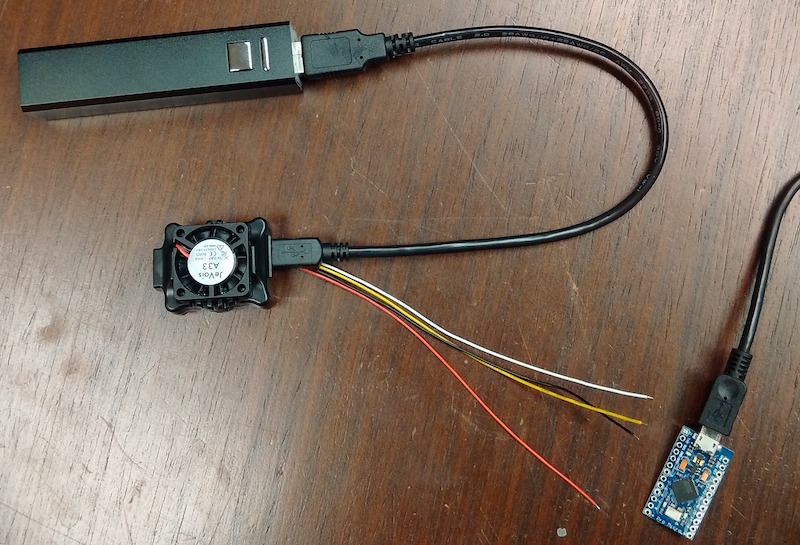 JeVois operating in standalone mode from a USB power bank (battery), with micro-serial connection (not yet wired up in the photograph) to an Arduino board that is powered from another source via a micro-USB cable shown at right. JeVois operating in standalone mode from a USB power bank (battery), here using a splitter mini+micro cable to also power an Arduino from the same battery bank. Make sure your USB power bank is rated for at least 1A output current. You can use a handy Step-UP DC/DC converter to power JeVois from sources that provide less than 5V (e.g., a single Lithium cell rated 3.7V nominal). In doing so, you are essentially building your own USB battery bank (those contain a Lithium battery plus a DC/DC converter inside). 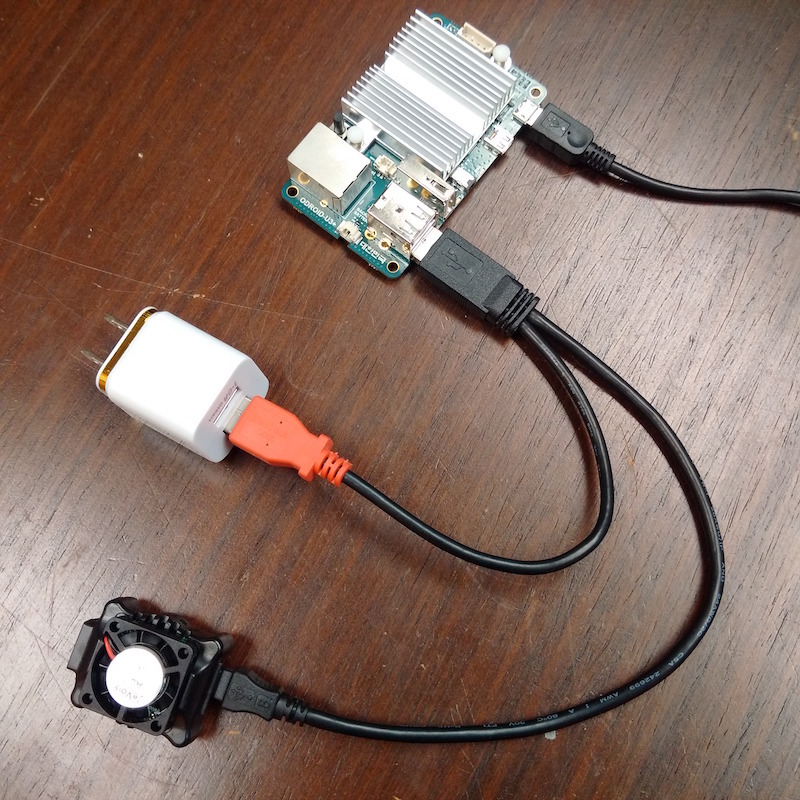 If you want to stream video data to a host computer that is too weak to power JeVois on its own, use a Y-type cable instead of the single cable shown above, as we have used in the previous scenarios. You can use a Step-down DC/DC converter to power JeVois from power sources that have voltages greater than 5V, such as a 12V car battery. 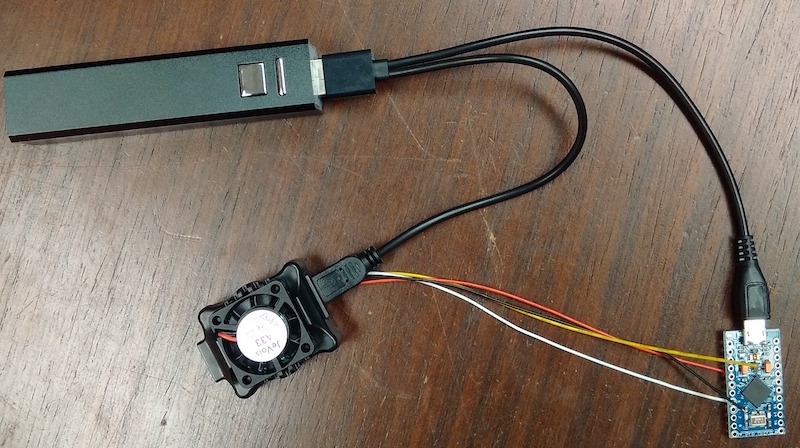 Here we show such a converter connected to a cigarette lighter adapter for a car. You can also use a standard cigarette-lighter USB charger (which allows people to charge their phones from the cigarette lighter port of their car). Make sure it is rated to provide at least 1A of current. 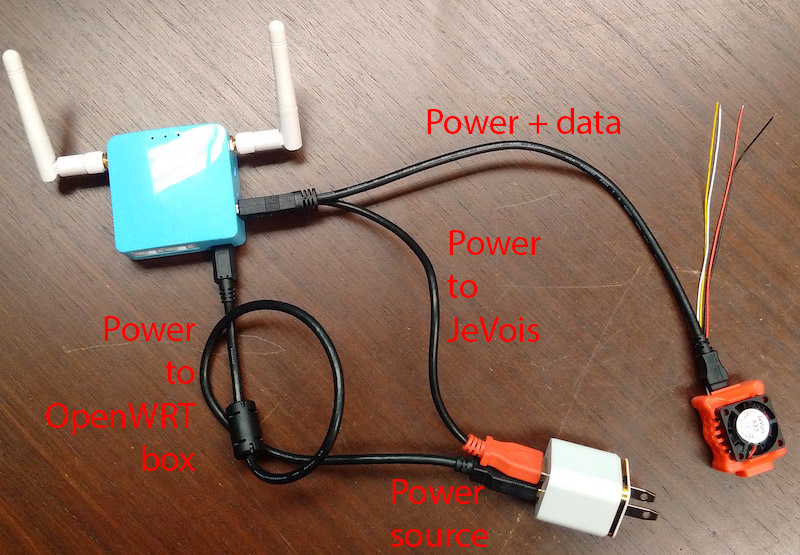 You then simply use a Y-type cable to connect JeVois to the USB port of the OpenWRT box and to an additional power source (the USB port on the OpenWRT box is unlikely to be able to power JeVois). 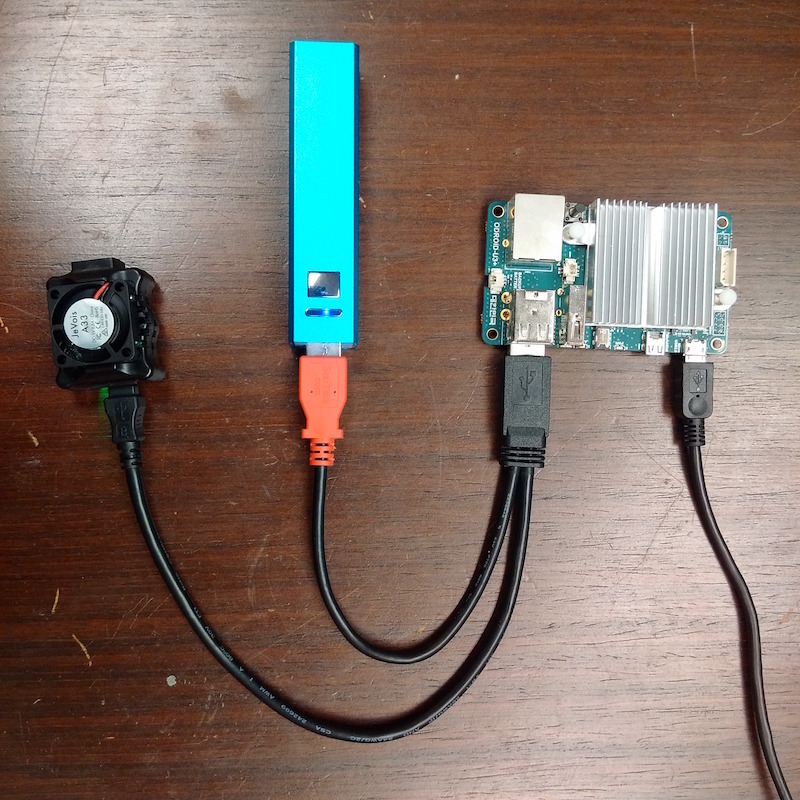 The OpenWRT box detects JeVois as a connected USB camera, and triggers the mjpg-streamer module. There is a bit of messing around with config files and options passed down to mjpg-streamer to select the correct resolution and you are good to go. You view the video by wirelessly connecting your tablet to the OpenWRT router (which acts as a wifi access point) and then pointing your browser to some URL (see the mjpg-streamer doc) where you will see the video from JeVois. Try a search for "GL-MT300N" or similar. Although we have not used this exact model, it should work just fine since it has OpenWRT and also a USB2.0 port to which you can connect JeVois. Note that the CPU in these OpenWRT boxes is quite slow (e.g., 200MHz single core) so the framerate at which you will be able to see the video may be limited. We could do 15fps at 320x240 MJPG in our tests. Because of the slow OpenWRT CPU, you may be better off doing compression to MJPG on JeVois and streaming MJPG video out of JeVois, so that the OpenWRT box will just forward the video frames over wifi without the need to compress them on the OpenWRT CPU. 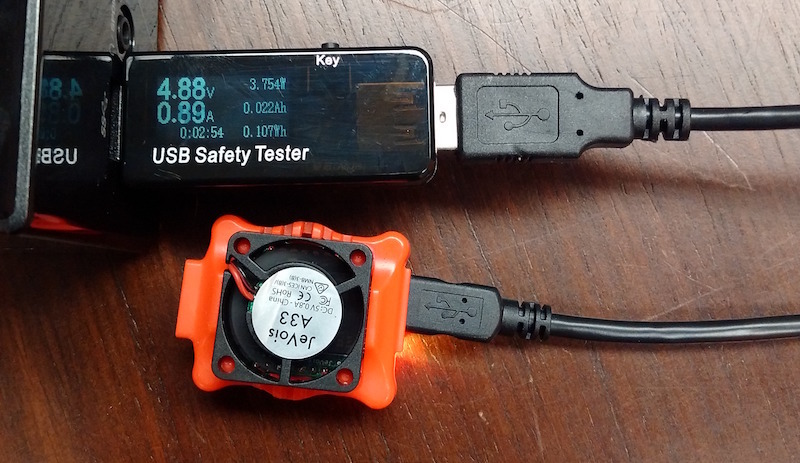 You can measure power consumption of JeVois using a USB power tester. Just make sure that use a single port to power JeVois (USB 3.0, charger, battery, etc) and not a Y cable, otherwise you may not measure the full power that is going into JeVois. With thin USB cables not rated for charging, sometimes JeVois may appear to correctly startup but is not detected by the host computer, or appears to work erratically (video connection drops, etc). [14977.226733] uvcvideo: Failed to query (129) UVC probe control : -19 (exp. 26). [14977.226736] uvcvideo: Failed to initialize the device (-5). then likely your cable is bad (not able to carry enough current), our your USB port is too weak, etc.